Looking back to 4 years ago, it is absolutely amazing to think of all the changes that have come into my life. Manifesting 1,2,3 was a big catalyst for these changes because I learned how our thoughts really create what we think. I began to manifest my wishes by saying them out loud every day. It was kind of like a comedy because I would talk about bringing a good man into my life in a joking way. I was focused on that idea, but I kept if fun. Also included where specific thoughts to reduce my chronic pain and weight, better health and having a better attitude. That is a very big list but everything on it was extremely necessary for the happier life I dreamed of. Things quickly began to come to me in the way of information from friends, literature and videos. It was just the information I needed and I immediately became quite the student while continuing to manifesting every day. From my studies, I became convinced that I needed a quick change in my diet. My first move was admitting that I was a sugar junkie and after stopping cold-turkey, I felt so much better in just 2 days! Next, I restricted my diet intake and the types of foods I was eating. The end result was dramatic. I went from a size 12 to a size 8 and I have never felt better! Another bonus. Apparently, a direct side-effect of the lighter me was a complete elimination of the pain I lived with for years!! Many of the materials I was studying also had helpful advice about reprogramming the way we think. I completely get the idea of thoughts bring results but I was also learning how to create and maintain calm in my life as well – another life-changer! Oh, and one more thing… I am in a relationship with a kind, loving and capable man. It all started with a conversation about Manifesting 1,2,3 and you don’t need #3 and look what happened! 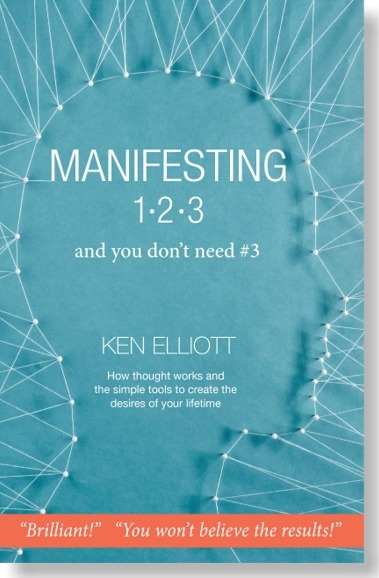 Ken’s book is simple, to the point and, compared to others I have read, the easiest manifesting book to use. He took me on an elegant, successful journey.